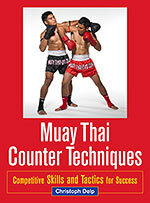 The book series on Muay Thai (Thai Boxing) features three books concentrating on basic techniques (’Muay Thai Basics’), counter techniques and competition (’Muay Thai Counter Techniques’), and training (’Muay Thai Training’). The books in combination with the DVDs provide a comprehensive detail on Muay Thai. The three Thai-Boxing books have been structured as such that they can be understood separately. The book on training, for example, does not require a previous study of the books on techniques. You can amend the book series with the book ’Fitness for Martial Artists’ which is aiming for an increase in the performance of the fitness components. Muay Thai Basics presents the sport’s history, development, rules, and equipment. In the techniques section, it first details basic skills such as the correct starting position and footwork. Next it offers a complete list of all the attacking techniques and a selection of effective defensive strategies. All techniques are presented step-by-step by Thai champions. The training section provides detailed information about the structure, content, and planning of training regimens. Suitable as both a self-training guide and a supplement to club training, the book offers authoritative instruction for Thai boxers and other martial arts enthusiasts. The primary focus of Muay Thai Counter Techniques is on counter-tactics, or techniques used to counter an attack from one's opponent. Muay Thai is a martial art with a variety of impressive techniques; every attack technique can be countered with a large number of variants. No two fighters will react to an attack in the same way, because while most Muay Thai fighters learn the same basic techniques (as presented in Muay Thai Basics), each fighter will go on to learn a wide variety of secondary techniques and will adapt them to his or her individual fighting style. In this book many well-known Thai boxers demonstrate the most important techniques for competitive success. Suitable for Thai boxers as well as mixed martial arts (MMA) fighters. Effective martial arts training, especially for a demanding sport like Muay Thai, requires a prudent training plan. Muay Thai Training Techniques shows amateur as well as advanced fighters how to best utilize their training time, whether at home or in the gym. The book teaches effective exercises to improve flexibility, stamina, and strength as well as basic fighting techniques such as feints, counters, and combinations. Muay Thai champions Saiyok Pumphanmuang and Kem Sitsongpeening are featured, demonstrating their own training methods and most effective techniques. Several ready-made, detailed training plans are also included for beginners, intermediate, and advanced practitioners. Fitness for Full-Contact Fighters presents a fitness training program expertly tailored to the martial arts. The book details the basics of martial arts fitness training and offers an in-depth description of its various elements: flexibility, stamina, and power. The exercises are described in detail and presented step-by-step. The book focuses on planning and monitoring one’s training and includes complete training programs as well as extensive advice on the proper diet. With this guide, martial artists improve their ability to perform in training and competition.